Teenagers are still going through many changes, both physical and mental. Peer pressure is extremely high for kids this age, and for overweight teens, the pressure to fit in is even greater. Overweight teens must cope with teasing, isolation, verbal abuse and low self esteem, just to name a few challenges. They face these challenges each day in addition to worrying about their teen weight loss challenges. Just like anyone trying to lose weight, support is a critical factor in their success. Teenagers need a support system as well which needs to include supportive parents. As a parent, here are some tips you can use to help your teen lose weight. These tips on teen weight loss are not about what to feed your teen or making them go to an exercise class. Instead, these are tips on how to be supportive, how to encourage lifestyle changes and how to open up the lines of communication. Sit down with your teen and have an open and honest discussion around their weight. 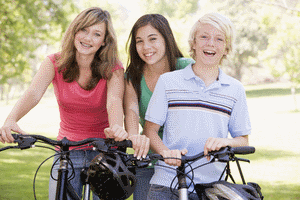 Let them know that it is up to them to take the necessary steps for their teen weight loss. You are there to support them in anyway you can. Let them know you are there for advice and guidance when needed so that together you can make healthier choices that can last a lifetime. Help your teen lose weight by setting the tone and example. Make sure your meal plans are healthier choices by selecting leaner meats, including salads and fruits and reducing the fried and fatty foods. 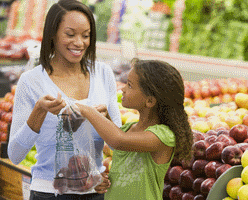 You may already be providing these healthy meals and acting as a role model. If so, keep it up and encourage your teen to join you each night for these healthy family dinners. If you also need to lose weight yourself, then join teams with your teen and become diet buddies. You can go to the grocery store together and plan the meals for that week. Working together on a common goal can be a great motivator for the both of you. Self esteem and self image can be difficult to discuss for both you and your teen. Many people measure themselves against unrealistic examples.Talk with your teen and let them know that there is no one size that fits all. One person’s body structure and weight may not be the right weight for someone else. We all come in different sizes and shapes, making each one of us unique and individual. Instead of focusing on a specific weight or clothing size, focus on working towards a healthy weight that fits their body structure. Their teen weight loss goal should be to get within the normal BMI range and not try to get to the very low end of what some call an ideal weight. Making healthier choices in foods and activity is where the focus should be to achieve their teen weight loss. Many teens are looking for a quick weight loss or an easy weight loss for teens. These methods don’t work for many people and can be especially dangerous for teens since they are still growing and changing. Getting the right amount of calories and nutrients is critical for teenagers in order to have a successful weight loss for teens. Let them know that they have their whole life ahead of them and that building the proper healthy eating habits and exercise routines now will help them maintain their weight for life. Even as adults, we are always looking for a quick weight loss, but we know it’s not the healthy way. Tell your teens that anything worth doing is worth doing right. As you can tell from the name of this website, I truly believe in getting active in order to lose weight. Teens should get about 60 minutes of physical activity a day. This can be done through sports, gym class, community programs or general household chores and yard work. . If your child is not athletic or does not like sports, encourage walking around the neighborhood. Instead of driving them to their friends house a few blocks away, suggest they walk there to get a bit more active provided it is a safe walk. Have them ride their bike to get to different places. Create family activities that can be done together like riding bikes, going swimming, playing basketball in the driveway or the park. Once they start to become more active, then encourage them to try and set aside 30 minutes a day for a structured aerobic or strength training exercise. This will help build a lifestyle change which will help them keep the weight off for good. Here are some healthy teen weight loss tips that you or your teen can read to start planning their weight loss program. If you want to help your teen get a jump start on their weight loss the healthy way, then check out these tips. To lose weight the healthy way, you want to make sure you get enough (but not too much) calories from the foods you eat. Find out more about the proper teen calorie intake to lose weight. As a teen, you need to eat different foods from all the food groups. This will give you the nutrients your body needs.